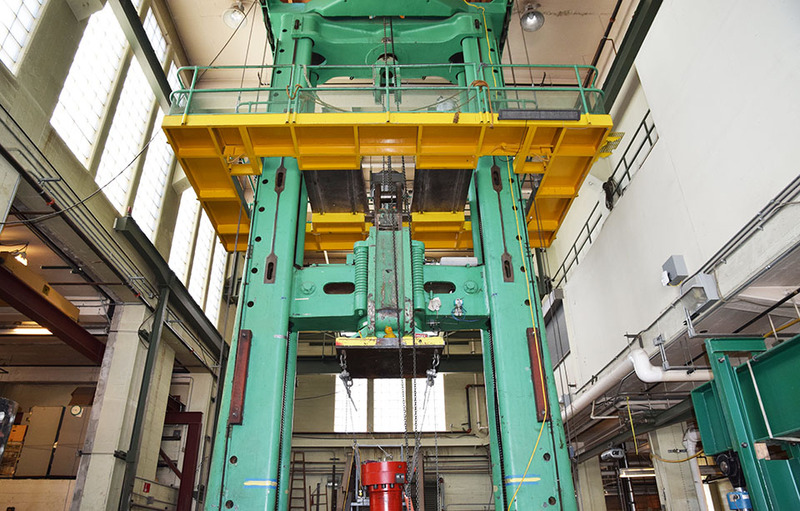 The largest facility of its kind in the Pacific Northwest, the UW Structural Research Laboratory (SRL) is located at the University of Washington’s Seattle campus, in More Hall. The SRL is a versatile facility for performing large-scale structural engineering experiments on civil infrastructure components and systems. The SRL features a strong floor and strong wall that can be used to apply large static and dynamic loads. Experiments conducted in the SRL contribute to the development of new structural engineering innovations, changes to building codes and solutions to critical problems associated with the structural design of civil infrastructure. The SRL has a long history of supporting industry, research and educational projects. A digital servo-controlled 2.4 million pound Universal Testing Machine, called “Big Baldwin,” used for research and commercial tests. High capacity dynamic actuators (one capable of applying more than 400 kips or 400,000 lbs.) that can cycle structural and other large capacity components to 10 inches in each direction. Dual-camera Optotrak system for movement capture, with more than 200 channels. Panel Element Tester (Coming Summer 2017): The first machine of its kind to be available on the west coast of the United States, the tester is an advanced apparatus that can apply arbitrary combinations of in-plane stresses to thin membrane specimens. For inquiries regarding lab use, including rates and schedule, please contact the laboratory director, Dawn Lehman.